BASS (Dicentrarchus Labrax): The Bass is probably one of the most targeted specimens of fish by sea anglers. They are easily identifiable from their silver scales along the body and darker back. They have large mouths and if you catch one be aware of their sharp spines and and sharp gill covers. They often fight hard and are considered one of the best sea fish to catch. If targeting Bass from a pier or marina wall it would be advisable to take a drop net and scales and camera (If you want to return it-which we recommend). Specimens are 9lb upwards but a Bass of 5lb+ is a very good fish. There are plenty of schoolie Bass up to 1 1/2lb and you often find them in shoals and are less difficult to catch. The British record is currently 19lb but there have been many fish close to that figure in Sussex in recent years. Bait: There are a range of baits that you will catch Bass on such as Ragworm, Lugworm, Peeler Crab, Prawn, Sandeel, Live bait and Mackerel Fillet. Each fisherman has their preference on what performs best at different locations but we recommend using whatever reflects the natural baits where you are fishing and the weather conditions. My personal preference is to use a live Joey Mackerel on a long running ledger bait. Hook it through the upper lip and let it swim. This builds upon their primal instincts as preditors. Where to find them: Bass like a range of different habitats, its a case of trying different spots. They either like locations with lots of snags, gullies and rocks in which they can surprise their prey. Alternatively they can also be found along open stretches of beaches in calm or rough weather, in calm weather they are often in shoals and are smaller mostly between 1lb and 5lb with the odd big one I have caught many while spinning for mackerel off the beach. In rougher weather the bigger there is more variety with the bigger ones coming out. Hot Spots: Rottingdean undercliffs, Brighton Beaches in early morning or eve, Brighton Marina. Methods: Depending on which bait you use it will vary your approach to catching them. If you are using live prawn then the best methods are either free lining or using float gear so that the prawns appears as natural as possible. This is good at rocky venues where fishing the bottom may result in a lot of lost gear. Another top method is spinning or plugging. These methods are quickly gaining a following amongst UK anglers and follow the big lure fishing movement in the USA. They provide great sport and a real adrenaline rush and i can see why so many people get hooked on this method after their first catch, i know i certainly did. Alternatively there are the more conventional methods of using lots of peeler Crab or a fillet/flapper of Mackerel on a pennel rig or running ledger or free lining a live Pout or joey Mackerel. Top Tip: Dont cast too far, often many good bass are caught on a miss-cast of when you birds nest your multiplier. This is because Bass like to hug the shore line and come in close to feed as the tide comes in evidence of this is anglers catching them in summer months on a spinner or plug which have limited casting distance. Wen fising a plug make it appear as real as possible or reflect an injured fish with twitchy movements as this will trigger the bass into a take. If fishing in the surf the 3rd or 4th breaker is considered to be the best. If pleasure fishing it is always worth taking an extra rod and setting it up with a Bass bait, it maximises your chance of getting that gooden but make sure your drag and rachet are set! Bream are a great summer fish that often provide strong and persistant bites but no fish when you reel in. This is because they have small mouths and will often pic a bait to pieces. The best thing to do is downsize your hooks to size 4 or even 6 and this should increase your hook up rate. 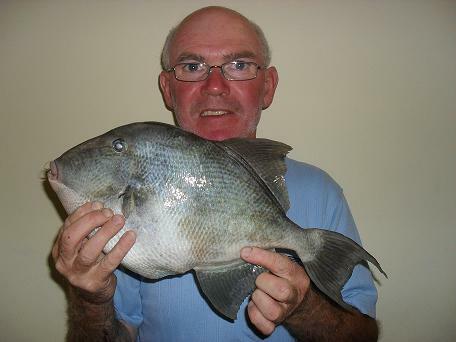 Bream are caught all along our coast during summer months. 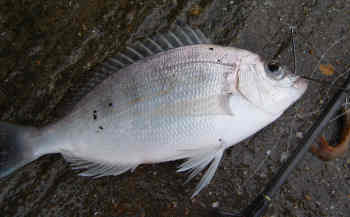 Big bream are often found at locations such as pagham where they can be caught up to 3lb in the months of May and June. 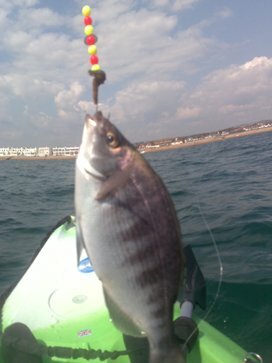 Between Worthing and seaford they are found from May onwards and a fish of 1lb is a good size Bream. Baits: They will take most baits put in front of them and its often a case of matching the bait to what they are feeding on. Mackerel strips, Squid strips, worm and crab can all be deadly on their day. If fishing a pier or harbour wall such as the marina, groundbaiting will often help produce a feeding frenzy and attract other species as well. Where to find them: Anywhere where there is mixed ground (rocky and sandy patches) as they use the reef to feed and for shelter. Hot spots: Pagham for large specimens. Shoreham beaches & arm. Brighton Marina East arm. Methods: use a 2 or 3 hook paternoster and cast 50 plus yards from the shore. It can be fished all up or in a 1up 1down or 2up 1 down set up. If fishing a pier or harbour dont cast far as they will be using the structure for shelter and feeding. Top Tips: If you are getting bites but no fish, downsize your hooks and shorten your hook lengths (snoods) as the smaller hooks will fit in the mouths and the increased tension of the short snoods will create more chance of a hook up. COD (Gadus Morhua): Unfortunately Cod have been seriously overfished by commercial fisherman and trawlers. This has lead to a reduction in numbers and the average size of fish caught. Cod can be caught in autumn winter and early sping, however the best time to catch them is between Nov-Jan. From boats they are caught all year round. Cod are easily identifiable from their green spotted flanks, large heads, barbel on bottom lip and often big bellies. 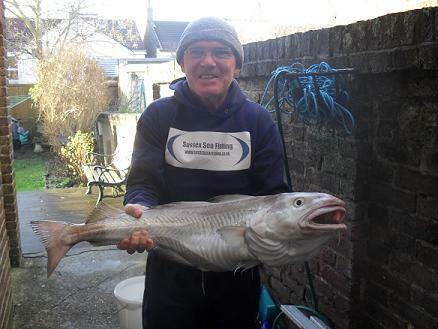 The British shore record for Cod is 44lb 8oz. Bait: Cod pretty much eat anything, we have even found a polystyrene cup in one. From the beach the best baits are juicy lugworm (black or blow) with a tip of Squid or Mackerel, alternatively peeler crab is also a great bait. When putting the bait on, it is recommended to tie is on with bait elastic to ensure that it stays on the hook when long distance casting and in rough conditions. Where to find them: Cod like rocky and kelp filled areas but they can also be taken on open stretches of beach. If your fishing a rocky or kelp filled areas then take plenty of tackle as you may lose some, a rotten bottom rig may be appropriate. Hot Spots: Seaford (Deep end by the cliffs) outside of Sussex a good place is Dungeness where you will also catch lots of other fish and iss well worth the drive. Methods: The best methods from shore are to use a clipped up Pennel Rig loaded with your bait of choice and cast as far as possible. Another method is using a 2 hook paternoster clipped up as this will maximise your chances of catching a decent size other species. When fishing for Cod i would recommend using 2 rods with the two above methods. This will increase the possibility of catching and also offer some sport with dabs and whiting being caught on the 2 hook rig . Top Tips: Fish at night for Cod as they feed in closer and more confidently. If you are aware of any deepwater marks then try them as cod prefer deep water and hence a long cast being considered best practice. This beast of 13lb 8oz was caught by my dad on Hove Beach in Dec 2009. I have never heard the end of it since! Bait: Black Lug, Blow Lug, Occasionally tipped with a bit of squid. They will also take King Rag but prefer lugworms. Where to find them: They like sandy or muddy sea beds so target any spots that you know have these. Most Sussex beaches have these once you get past the initial shingle. Hotspots: Hove or Seaford beaches. Top tips: They like smelly, stale lugworm so any old packs you have or any that have been in the freezer for a while will definately be worth using. 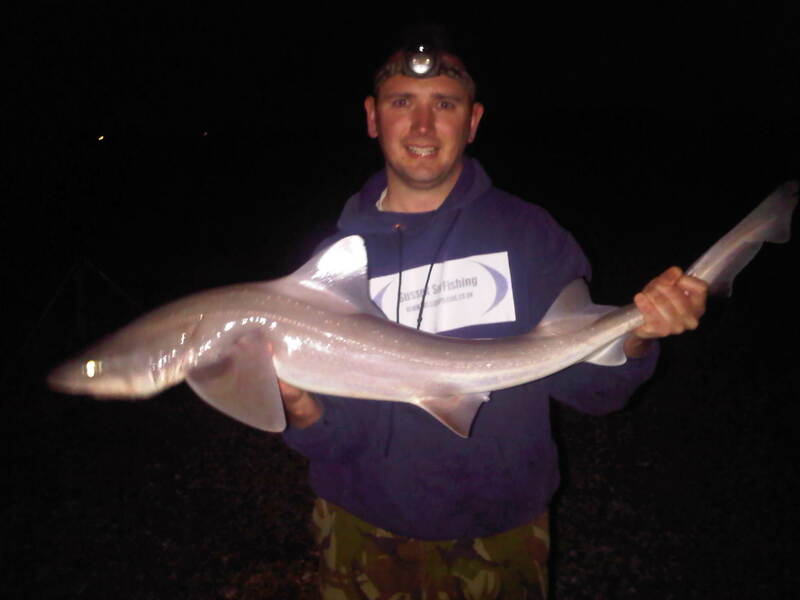 DOGFISH, Lesser Spotted (Scyliorbinus Canicula): Dogfish are considered a pest by shore anglers in some areas and by boat fishermen but within the Sussex beach fishing scene they are not such a problem and are considered as something different or a novelty rather then a pest. They are the most common species of the Dogfish family that you are likely to catch from our shores. The British shore record for the LSD is currently 4lb 15oz 3dms. Avoid striking bites from Dogfish as this may result in you missing the fish. Many anglers believe that just waiting and letting it hook itself is the more productive method. Bait: Frozen Sandeel is the most renowned dogfish bait and for some reason is more productive than using fresh Sandeel. You can also catch them on other fish baits such as Mackerel which is oily. This is because like most Shark species they follow scent trails and will feed once bait is found. If on a boat they can become a pest taking almost any bait put to the bottom. Where to find them: They can be found in most water conditions such as really murky or crystal clear water. They feed/hunt mostly on scent so oily baits are best. They prefer clean water so heavily polluted areas are worth giving a miss. Hotspots: Brighton Marina can be productive for them after dark on the high tide but best known areas are worthing and seaford after dark. Methods: Long casts are prefered for catching Dogfish and therfore clipped down 2 or 1 hook rigs are adivsed with sharp size 1 or 1/0 hooks. Top tips: A bait commonly used is a section of ragworm combined with a section of Sandeel. you will find that you may catch more than just Dogfish using this tactic. Some believe that spraying your bait with a bit of WD40 will help as it gets an oilly scent trail going which supposedly attracts fish. 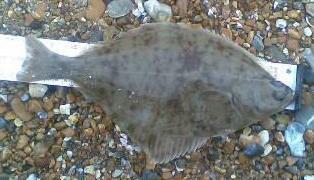 FLOUNDER: The British record for a flounder is currently 5lb 7oz. Bait: Ragworm, Lugworm, Peeler Crab, slipper limpet, live prawn. Where to find them: You will find them across sandy or muddy locations. Often they will start to go up the rivers Ouse and Adur from April onwards. Before that you wil catch them along the beaches. You will also catch them on the inside of harbours, marinas and local ports as they like the muddy bottom. Hotspots: Hove or Tidemills beaches in March-April, up the rivers mentioned in the following months. Methods: A wishbone rig can be highly effective as it gets two baits in close proximity. It is not unusual to find that the fish has taken both hooks. Top tips: Use bright beads and spoons as Flounders are attracted to the colours and then take the baits. I have even caught them using a small mepps spinner with a single hook retrieved slowly along a sandy bottom. GARFISH (Belone Belone): Garfish are probably one of the most easily identifiable fish found in the UK waters due to their long body and long toothy beak. They are silvery along their flanks and this is why they can be used as bait. Their scales come off easily on your hands and clothes and they have a strong smell due to their oily skin so it is recommended using a damp cloth when you are unhooking them. Garfish provide great sport on light tackle and when hooked will often come tothe surface and jump out of the water in an attempt to dislodge the hook. Have a set of bait discorgers to hand as they often take the hook deep. They are good eating but often put alot of people off due to their green bones. The British record is currently 3lb 4oz 12dms but any fish over 1lb is a good local specimen. Bait: Mackerel or Garfish Strips, Spinners and Sandeels. Where to find them: They patrol the surface of the sea and can be found anywhere along the Sussex coastline. They can be found near marinas or piers but also will patrol long open stretches of beach like Seaford or Hove. If there are Mackerel or Whitebait about then the Garfish will not be far away. I have caught many while spinning for mackerel. Sometimes they shoal in large numbers and make similar disturbances on the surface to mackerel. Hotspots: Brighton Marina is renowned for producing large numbers. The east arm is better for catching Garfish. Newhaven East arm has also produced some good sized fish. Methods: Float fishing is one of the most productive methods for catching Garfish. Use anything between size 4-8 hooks. light tackle is a must because catching Garfish is all about the fun and sport. Fish a float bait anywhere between 6-18ft depending on where you are fishing and what the sea is like. If the sea is calm then fish shallow, if the sea is quite choppy but clear then fish a bit deeper as they will sometimes be deeper in rough weather. If floatfishing and not catching them try varying your depth by adjusting your floats stop knot. sometimes it will look perfect for them to be shallow but they may be deeper. Top tips: When float fishing look for strange float activity like it wiggling, going on its side or moving in the opposite direction from the tide. If you get a bite and miss it then stop reeling in as they often follow up the bait and have another go. Reel in floated bait slowly as this sometimes induces takes from garfish as they are attracted to moving baits. They are attracted to flotsam or rubbish on the sea surface like wooden crates so cast near them if you see some passing. Use a Sliding Float if you are having a tuff time catching one, the way to create this rig can be found in the RIGS section of the site. Gurnard: One of the pretiest fish in the sea in my opinion. They are also known to be good tasting. Bait: Most types of bait seem acceptable to Gurnards but i have had the most success on either rag worm or Mackerel strip on size 4-2 hooks. Where to find them: Any sandy bottom will often produce Gurnards and mixed ground is also good. I have had a few off Newhaven East arm and the beaches near Shoreham arm. Methods: I have had gurnards on all sorts of rigs. The best type of rig is any that has a hook length on the bottom as they are bottom feeders. That said, they will take a moving bait slightly off the bottom as I have had a few on Feathers when on the shore and on the boat while the lead has slowly come across the bottom. Trigger fish: These usually hit our waters at the end of the summer once the temperature has picked up. They are an odd looking fish and you need to be aware of the spine (that is like a trigger) on the top of their backs as this is sharp and long! The specimen below was one of 6 caught by my dad in a session just 2 miles off Brighton in the HDSA boats. It weighed 3lb 8oz. They are also caught on Brighton Marina West arm in the height of summer. LESSER WEEVER (Echiichthys Vipera): BE CAREFUL AS THEY HAVE A POISONOUS STING WHICH CAN REQUIRE HOSPITAL ATTENTION IF YOU HAVE A REACTION. The poisinous sting can be identified by a black spine along the upper back. Bait: They can be caught on a range of baits including mackerel strip, Ragworm and Lug worm. Where to find them: They are often found along shallow sandy shore lines in which they hide under the sand to avoid predators. Methods: Often caught whilst targeting other species. Top tips: Dont touch the spine!!! MACKEREL (Scomber Scombrus): The Mackerel is a member of the Tuna family and provide great sport to newcomers and old hands. They are identifiable from their silver underside and stripes across the top of their back. Another member of the Mackerel family is the Scad which is more commonly caught at dawn or dusk. The mackerel are not only great sport but they are relatively easy to catch and are great to eat plus they are an effective bait due to thier oily skin. The British shore record is currently a whopping 5lb 11oz, however most average about 12oz with the bigger ones coming early in the year and at the end of the summer. The shore British record for Scad is currently 2lb 7oz 8dms. Another fact is that with the warmer sea temperatures there have been some Spanish Mackerel caught in Devon and Cornwall from boat and shore with two records being set in 2001 and 2003. Bait: Feathers, Lures, Mackerel or garfish strips and even things like tin foil or plain silver hook. This is because they are predatory and in a feeding frenzy will take almost any bait infront of them. Where to find them: Anywhere in the summer, they chase fry and whitebait in shore and along marina,harbour, pier walls. When fishing for them look for disturbaces on the surface of the sea. Hot spots: Brighton Marina west arm, the only problem is the amount feather fishermen packed onto the arm which means other methods are often out of the question. For example i cycled top the west arm up to the float fishing only bays to find that there were 6 feather fisherman packed in. When confronting them i got told where to stick it and then went on the other arm. Therefore the East arm also offers great sport with all round less hassle. Other hotspots include Brighton, Hove and Seaford beaches with massive shoals often being seen. Methods: Feathers, which in my personal opinion is fine for bait or begginers but when you see people catching hundreds and killing them needlessly is wrong. Float fishing is great sport for catching mackerel, using this method you can also catch Garfish, Pollack, Bream and Bass depending on where you fish and how deep you have the stop knot. My personal favourite method is spinning with either a spinning rod or a 3 piece river rod with thin line (10-15lb line). the best all round lure is the Dexter Wedge as it casts far and has great action in the water, i have had countless fish using this method plus a variety of other species such as Bass and Garfish. there are numerous places to lure fish and everyone has their favourite spots. My most productive sessions have come from Brighton Beach (banjo groin) and Seaford beaches. both are best fished at dusk and often large shoals can be seen. Fly fishing is a relatively knew for of targeting these species and i am assured that it is highly exciting especially when flys are fished on the surface. Top Tips: Look for disturbance on the waters surface. If float fishing try varying the depth of your bait by advusting the stop knot. sometimes the fish are on the surface but sometimes they are much deeper. If spinnig keep a check on your line near the spinner because it can get freyed and lead to a lost lure or fish. 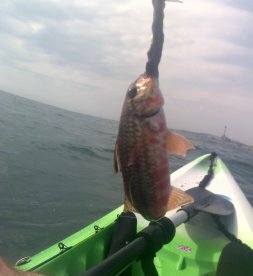 When fishing for Mackerel take an extra rod which is a bit more sturdy as If you catch a small Mackerel (known as joeys) then its always worth using one as live bait as there is always the chance of catching a Bass . IF fishing from a pier or marina at night then a top tip is to drop a tilly lamp or bright light down the side of the wall and hang it a few feet above the water. This will attract bait fish and bring in the Mackerel and Shads and allow you to float fish into the night. While you have the fish there, keep chucking in a few small mackerel strips to keep them feeding. MULLET: Mullet are a difficult species to catch due to them being wary, having good eyesight and being spooked easily. There are different species within the Mullet family and different tactics are required dependant on which species you target. They are sought after along the same lines as Bass with Fishermen only targeting mullet when fishing. This is because pound for pound they are one of the hardest fighting fish. There is a great website dedicated to targeting mullet which can be found at:- http://www.anglersnet.co.uk/authors/leon22.htm it is well worth a visit as it taught me alot about targeting mullet and goes into great detail which is testament to what a great fish they are to catch. Some days there will be hundreds of visible mullet bt you just wont catch them as they are not feeding so dont be disheartened. Golden Grey Mullet - The smallest of the set with the Bitish record being 3lb 0oz 4dms. It can be identified by the Gold spot behind it eyes and a golden sheen to its body. They are considered relatively rare to catch but one year me and Glenn Arnold had almost 100 between us within the Brighton Marina. Thin Lipped Grey Mullet - The British shore record for this fish is currently 7lb. Thick Lipped Grey Mullet - This is the biggest of the Mullet with the British shore record being 14lb 2oz 12dms. Bait: Bread, King Rag, Red Rag, Maggots, Mackerel flesh. You can get Mullet feeding on most things providing you groundbait a swim effectively. Where to find them: They can be caught from open stretches of sandy beach, within saltwater sections of river, within harbours or marinas. or shoaling up and down piers or harbour walls. Methods: Stealth is the key, they get spooked easily so be careful and dont let your reflection hit the water or have a radio on or anything like that. Groundbait is key. They can be caught using a number of methods and each mullet fisherman i speak to has his own secret weapons/methods. Use as light tackle as possible with many anglers adopting course fishing methods and equiptment. Low diameter 8lb line is appropriate with anything up from a size 10 hook, make sure the hooks have a strong barb as mullet are renowned for being lost due to the strength they fight with. Dont bully a mullet in as this is a surefire way to lose one. If you are fishing from a height such as a pier or harbour wall then a drop net is essential and when you net it, do it far away from the area your groundbaiting to avoid spooking the others. Mullet are not considered god eating so unless you really like the taste or think you have a potential record then put it back as they take many years to get to a good size. Top tips: The Key is to get them feeding, Ground baiting over a period of time is an effective method to attract the species and have many a good session. Boil up some mackerel flesh to make it soft and mix it with a variety of baits and either feed handfulls into the water or lower a netted bag known as onion bags filled with groundbait into the water to get a scent trail going. After one has been caught expect few fish for a while as they may get spooked. Keep the rod secure because if you get a good one you can lose your rod! You can tell how old a mullet is by counting the rings on any scales that come off. One last point is dont srike too early as this will result in a lost fish and a possibly ruined swim. PLAICE (Pleuronectes platessa): They are identifiable from their bright orange spots and rounded body. They have a white underbody. 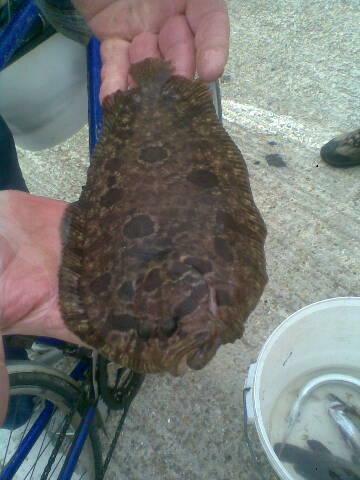 The British shore record for Plaice is 8lb 6oz 14dms. Plaie apparently take a long time to grow (up to 30 years) so they are a slow growing fish that we may see less of due to their heavy overfishing by trawlers because they are becoming a popular fish to eat. Spring and early Summer is the best time of year to fish for them with March and April being the best for larger fish. Bait: The best bait is Ragworm with lugworms also being effective. Peeler crab can also be a good bait to use in spring. A bunch of small wriggling ragworm are good from the shore with a bigger single worm working from boats. Where to find them: They like sandy and muddy bottoms as this is where they are able to blend into the sea bed. they can also be found at rocky marks. The best time to fish is at long distance over high tide. Hotspots: The end of the west arm at Brighton Marina casting outwards and away from the arm. Methods: Fish clipped down rigs and cast as far as possible. Use aberdean hooks as this allows you to slide alot of worm up the hook shank. A one or two hook clipped down rig will allow you to get distance. One of the best methods is using a clipped down wishbone rig as this allows two baits to be fished close together with bright beads on the snood. This is because of the inquisative nature of the fish. You may fond that you wil also catch alot of flounders using this technique. Top tips: They are very visual hunters so therfore beads and spoons attatched to long flowing snoods can be deadly. I prefer a mix of black and green beads one after another (about 8 in total) with a small spoon also attatched after about the 3rd bead. POLLACK (Pollachius Pollachius): The British record for pollack caught from the shore is 18lb 4oz. Most local fish will be between a few ounces and 1 1/2lb with the occasional bigger one being caught. If you catch a pollack try and return it quickly or put it in a large bucket of sea water to recover as when they are hooked they fight very hard and can suffer exhaustion and die if kept too long out of the water. Take a set of discorgers or pliers to unhook the fish as sometimes they take the bait right down. Bait: Live Prawn, Live Sandeel, Mackerel strip and sandeel or prawn lures. They also take King rag, harbour rag (red rag) and peeler crab but these appear not to be as deadly as the first set of baits. Where to find them: Inshore they prefer pier, harbour, marina walls such as brighton marina, shoreham harbour, eastbourne pier. Methods: Float fishing at depth is a good method for catching them, using any of the above baits is suitable with live Prawn being one of the best. You also have the chance of picking up a Bass on this method. Top tips: Try lure fishing for them, I have had productive sessions on the marina using either a fake sandeel or fake prawn with size 4 hooks on a long piece of line and a small weight set up like a ruinning ledger which allowed me to cast over the rocks. Retrieve at a medium pace and wait for the bites. If fishing on the marina fish at about 16-18ft. POUT, bib (Trisopterus Luscus): Often considered a pest by many fishermen as they often take baits intended for other species and can often use up alot of bait very quickly. If this is the case and you are targeting larger species, it may be worth increasing the size of the hook to overcome this. However they can be the difference between a good or bad day for match anglers and some pleasure fishermen. The British record is currently 4lb 9oz but a good one locally is anything over 1lb. Bait: Pretty much anything available when they are feeding. Ragworm, Lugworm, Peeler crab. Any of the fomer tipped with a bit of mackerel or squid. Where to find them: You can catch them more or less anywhere. Smaller ones like structures as they provide some security from preditors, you do get the bigger ones in amongst them as well. At night you can catch them on open beaches. Methods: Most rigs will catch pout as they are not fussy and will tend to eat most baits put infront of them. The best all round rig is a 2 hook paternoster with one up one down. Top tips: If you want to catch a big one, the best time is a high tide at night and use larger hooks as this will stop you catching lots of small ones. The best option is to try a variety of baits. In my experience the bigger ones tend to like peeler crab. Red Mullet: These are not hugely common and I have only had a few. As you can see, this one was on my Kayak in August. Rockling (Gaidropsarus mediterraneus): Much like Pout these are considered a pest by many except match fishermen. However i would much rather catch a few of these rather then nothing even when pleasure fishing. They are commonly found between Oct-Apr, during rough weather or just after high winds. The shore caught British record is currently 1lb 9oz 12 dms. Bait: Pretty much any bait available at the time of year. Where to find them: During the months of Oct-Apr they can be found in numbers along the Sussex coastline. Hotspots: There are no particular hotspots for these fish as they will turn up anywhere. However Hove beaches often provide good sport to these fish. Methods: Caught on most methods but a 2 or 3 hook paternoster is popular amongst match fishermen. vary casting length as often they will be in close to the shore (50yrs) but during rougher weather they are a little further out. Top tips: They like rough weather so will often be found in the winter during or just after high winds. Shad (Allis & Twaite): Thanks to Edward Bettison who contacted me regarding a catch of his. 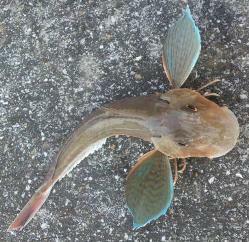 While fishing recently, he landed a species which he did not recognise. After taking it home and doing some investigation, his catch turned out to be an Allis Shad. Upon realising this and learning that they are a protected species Ed contacted the Environmental Agency for some advice as any responsible angler would, and he was delighted with their support and response. They advised him that: Both shads are in fact protected under the Wildlife and Countryside Act (1981) which prevents anyone obstructing access to spawning areas, or to damage or destroy gravels used for spawning [Schedule9(4)(a]. Allis Shad are also protected under Schedule 5 which means you can not intentionally kill, injure or take one - what this really relates to are people deliberately going out and targeting Allis Shad. Silver Eel (Anuilla Anguilla): You can identify them by their long snake like body. They will have either a silver or yellow underbelly. You will often find that they are very wriggly and can become a pest if they keep tangling up your line. I would recommend having a damp cloth and when you get them in stroke along their back a few times and they sometimes go into a sleepy state. Bait: Peeler Crab, Ragworm, Lugworm and occasionally fish baits. Where to find them: Rivers like the Ouse and Adur. In spring and summer months you will also find them over rocky beaches on calmer days and you can catch them at most locations when the water is dirty. Hotspots: From the shore you are best trying Goring with plenty of Peeler crab, if it is too weedy then try the east arm of Brighton Marina anywhere up to peg 20. Alternatively try fishing either of the rivers mentioned as they hold some good sized Eels that are on their way up to the brackish and fresh water. Methods: Use a 2 hook rig with size 4 and bigger size hooks. There is no need to distance cast especially when you are up the river so there is no need to use clipped up traces. Top tips: Use bigger hooks size 2 and bigger with peeler crab as bait and you should avoid the numbers of small fish. I would suggest trying the rivers just before the become brackish as this is where i had my two personal best Eels of 2 1/2lb on crab and size 2 hooks. You also have the chance of bagging a big Bass while fishing this way at most of these locations. Smoothhound (Mustelus Mustelus): Smoothhound have almost got a cult status much like Bass with more and more anglers targeting them from the shores. This may be because on the right day you can catch many fish of good size in a session with 5lb plus fish not uncommon. There are actually two different species of Smoothhound. The common smoothhound and starry smoothhound with the main difference being how they give birth. Smoothounds are known to feed in packs so if you catch one then there should be plenty more about. the main thing with smoothounds is that they can occasionaly be hit and miss with all the conditions and baits being perfect but no fish. the best thing is to ask local anglers or read reports to see if there have been many caught in the previopus few days and if so then go for it. If you cant find any info then still give it a go because fishing with big peeler baits means that even if the smoothys arent there you may still catch a big Bass, Eel or ray. A higly important thing is to set the drag and sit very near your rod because if you get a bigger one on the shoot off like a rocket when first hooked and you may lose your rod if you dont do this!!! Expect a good fight and just when you think the fish is done expect another strong run! Excuse the crazed look on my face but this was my PB of 12lb 8oz. Bait: Peeler Crab, Hard back Crabs and Peeler Spider crabs are the best baits for targeting Smoothounds. The smaller ones will also take Ragworm with the occasional larger one also taking them. But as a general rule nothing really beats peeler crabs. Where to find them: They prefer sandy, Gravelly and muddy sea beds which suits most areas of the Sussex coastline. I have had reports from all over Sussex of smoothound being caught this year so they can be caught at most locations. Hotspots: Brighton Marina has produced some really good sized fish this year. Climping and Goring are also well known hotspots as are Shorham beaches, the only problem with these areas is the large levels of weed that can sometimes ruin a session. If you are fishing after a big wind then i would suggest avoid these and go to the marina for a bit more of a stress free time. But then again the saying is no pain no gain so its really your choice. 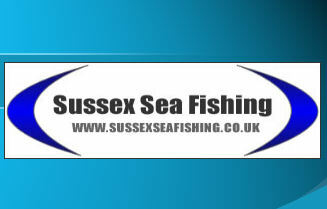 The most renowned locations are Pagham and Selsey as they are known for producing a good number of double figure fish. Methods: use slightly stronger line than normal such as 20-35lb snoods as the rough skin can shred weaker breaking strain. There is a range of methods you can use but most commonly they are caught on a pennel type rig with anything from size 1/0 - 4/0 hooks. The main thing is that the bait is on the sea bottom as this is where they feed. Top Tips: Peeler crabs is a must and set your drag and never leave your rod! SOLE (Solea Solea): Soles are most commonly caught at night as they are primarily a nocturnal hunter although you will catch the odd one on overcast days in murky water. The sole are one of the best eating fish on the Sussex coasts. As the name suggests it is shaped like a the sole of your shoe. The soles sking is much like that of Dogfish because it is smooth of your stroke it one way but like sandpaper if you push the other way. The British record for shore caught Sole is 6lb 8oz 10dms. Bait: Lugworms or Ragworms, the fresher the better. Where to find them: Sandy or muddy bottomed areas or beaches. Hotspots: Seaford, Newhaven, Brighton Marina and Pevensy Bay. Methods: The most common methods are two or three hook paternosters with a hook on the bottom. Alternatively you can use a 2 or 3 hook rig with small booms and size 4 hooks. Top tips: Fish a night tide with plenty of lug and ragworm on a sandy beach. Also us small lead shot on each snood to keep the bait static on the bottom. You dont need to cast too far either as they do come in close to the shoreline at night to feed. 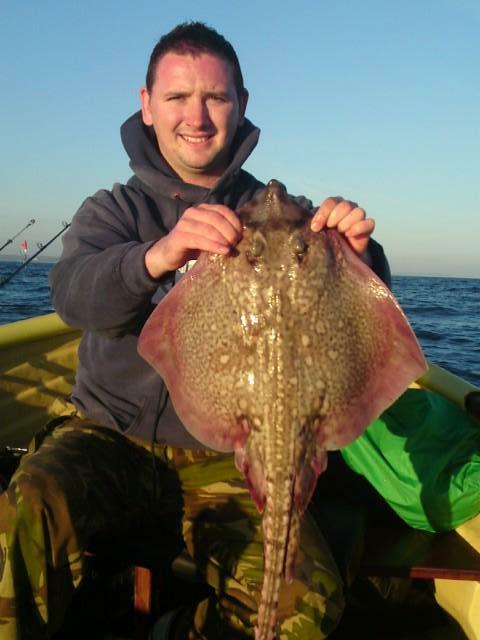 THORNBACK RAY (Raja Clavata): The British shore record is 21lb 12oz. When caught they are not particularily strong fighters compared to other fish but they are quite difficult to reel in and at first can feel a bit like you have alot of weed or a carrier bag on your line as they lay flat against the tide like a sail in the wind or 'kite' effect which creates alot of resitance. Be aware of their thorny boney spines town their back and tail. Bait: The larger specimens often prefer fish baits like Mackerel or Sandeel. Smaller ones can be caught on King Rag. Peeler Crab can also be an effective bait. Live prawns are also useful but can come off the hook if power casting. Where to find them: Along most of the Sussex coast from spring to summer. Fish at Dawn or Dusk. Methods: Smaller ones can be caught on a two hook paternoster or flapper and are more commonly taken on the bottom hook. A Method for the larger specimens is to fish a single hook clipped down or a ledger type approach. Another method is the clipped down Pennel Pulley rig as this alows you to fish large baits at distance when required. Top tips: Target gravell, muddy or sandy sea bedded areas as this is their most common hunting ground. Summary: A very rare flat fish. In fact, i have never caught one and never seen one caught, however, the one in this picture was caught by Sam on the Brighton Marina east arm in 2008. Very little is known about their feeding habbits or favoured locations. WHITING (Merlangius Merlangus): The British record for Whiting is currently 4lb 0oz 7dms. Whiting turn up on the Sussex coastline between October and March with the best months being November and December. They primarily feed at night and this is when you will generally catch the larger ones. Bait: Whiting take a variety of baits with the best being either a nice juicy black or blow lug tipped with a strip of Mackerel or Squid. In the day time i find that king rag is also a useful bait due to the amount of mevement it generates. Its also good to use ragworm in the months of Feb and March as you may catch a flounder as this is a good time to target them. Where to find them: Whiting will show up throughout the Sussex coast line and dont have a particular feeding preference although deeper water marks seem to be more productive. Hotspots: Seaford and Brighton beaches at dusk or night tides. Alternatively if you dont mind travelling then Dungeness is a good spot for bagging up on Whiting. Methods: The best method for targeting Whiting is a 2 or 3 hook paternoster because they are not that fussy or difficult to catch, plus it allows you to try a variety of baits. This is important because sometimes you will find that on certain days some baits will out fish others by far so keep a note of which baits are catching the fish. If you are targeting bigger size whiting then try a Pennel rig with size 1/0 hooks or bigger, or just use larger hooks on your Paternoster. This will stop the smaller fish from taking the baits all the time but you may be surprised at the size of bait and hook a greedy whiting will take. Plus you always have the chance of catching a Codling (although its becoming more difficult). Top tips: Yellow or glowing beads are renowned for attracting whiting so put a couple at on the line above the hook. BALLAN WRASSE (Labrus Bergylta): Wrasse are one of the most underrated pound for pound fighters. The British record is currently 9lb 1oz. They prefer clear calm water and stay close to rocky or weedy marks. they can be found in local waters between late April and October. Bait: Peeler crab, Hard back crabs, king rag, Red Rag, live prawn. Bright coloured small plugs are used at rocky marks in Devon and Cornwall but i havent heard much about them being used in Sussex so it may be worth a go. Where to find them: Wrasse prefer rocky, snaggy and weedy marks and once caught will often dive straight into the nearest snag and sometimes result in lost gear. If you find this frequently happening i would upscale the strength of line and use one hook to avoid any excess hooks getting caught up. They prefer clear water so it is best to fish for them after a clam spell. Methods: Bottom fishing is considered the best method, especially on the marina with heavy tackle being used because of the level of snags. 15lb+ line is recommended with anything from size 4 hooks upwards. The only problem with this is that if your fishing the marina many baits will also attract pout, pollack and pretty much most species that live near the marina wall so it will be a case of working your way through them. you can upscale the hook size although dont go too big. If your having problems with pest fish then try using small hard back live crabs as the wrasse use their powerful jaw and rough teethe to feed on them. You can float fish for them at locations such as the Rottingdean and Saltdean undercliffs. Top tips: The key is not to cast far away from a pier, marina or harbour wall as they stay close to snags. Crabs and prawns tend to catch the bigger species pls the chance of a Bass, ragworm tends to attract the smaller ones plus pest fish. If you have any questions about targeting specific fish in certain areas then feel free to contact me at craigide@hotmail.co.uk as i cant put every detail possible on this page, i will reply with a detailed answer as soon as possible, usually within 24hrs.